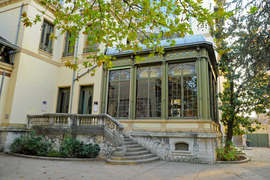 The Lumière villa is the last surviving evidence in Lyon of the tremendous industrial success of Antoine Lumière and his two eldest sons, Auguste and Louis, the inventors of the Cinematograph. 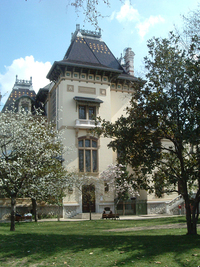 The villa that is today home to the Musée Lumière, bears witness to the impressive social rise of this sometimes excessively adventurous self-taught inventor. An artist and a bon vivant who incarnates the figure of the self-made man and who has inspired cinema so extensively. Having made a fortune, Antoine begins to spend without counting to nourish his passion for brick and mortar and architecture. 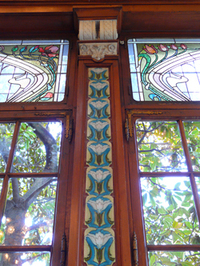 In 1891, in la Ciotat, he purchases 90 hectares of vineyards and has a true forty-room palace built. 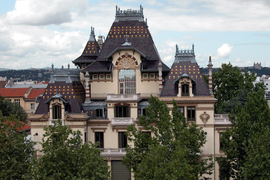 In 1896, he purchases a vast villa in Evian-les-Bains and has it converted into a château. (Today it houses the City Hall). In 1898, in Cap-d’Ail, near Monaco, he has three monumental villas built overlooking the sea. 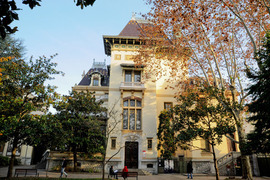 In 1899, last but not least, in Lyon, he launches the construction of the house that, opposite that of his two sons, is designed to bear witness to his success and artistic tastes. But this extravagance has a cost: Antoine sells the shares in the Lumière limited liability company that the creditors are threatening to confiscate and the two brothers find themselves obliged to take over the management of the business from their father. Auguste Lumière wrote in his memoirs: "My father was a brick-and-mortar maniac... Carried away by the success of our company, he soon bought a property in La Ciotat where he had a large and beautiful villa built. He then created a vineyard with huge cellars. He also had other buildings completed in Evian, la Turbie and last but not least, in Monplaisir...". Antoine’s villa dominates Monplaisir square. He himself drew the plans that the architects Paul Boucher and Charles-Joseph Alex followed from 1899 to 1902. The general trend for the house is that of Art Nouveau, a mixture of styles, with its irregular volumes and varied elevations. Its imposing silhouette earned it the nickname of the ‘château’ by those who lived in the neighbourhood. The variety of the materials used contribute to the polychromatic effects, with white limestone balustrades, terraces and balconies on both sides of the house, grey limestone stringcourses and cornices, brick and white stone dormers and chimney stacks, glazed and enamelled scale-like roof tiles and metal, glass and ceramic wall tiles in the winter garden…On the last floor, an eight meter-high conservatory, facing north so as to allow the best natural light to penetrate, lit up the splendid painting workshop that Antoine had designed, as in all his villas. The layout of the house is traditional: the basement is for the service quarters, the ground floor for receptions, the main two upper floors for the family apartments and the attic for the servant bedrooms. The ground floor is organized around the imposing main staircase and the hallway, with the drawing-room directly in line with it, the kitchen and dining-room on the right, the billiard room and the stunning winter garden on the left. As is usual, the drawing-room is placed at the centre of the house, but surprisingly it opens onto an interior gallery or conservatory with large bay windows. The vast rooms are dedicated to the particularly vibrant social life of the owner. For the interior decoration, Antoine called upon his artist friends such as the painter Eugène-Benoît Baudin, specialised in flower painting, the sculptor Pierre Devaux or the wood sculptor George Cave. 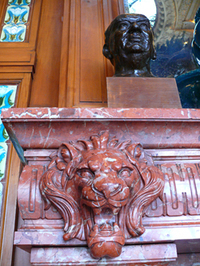 Pressed cement tiled floors in the winter garden or in the former lavatories on the upper floors, marquetry wooden floors in the dining room, marble plinths, panelling and doors with pediments in high relief, the Art Nouveau effect also imposes friezes in ceramic and carved wooden fireplaces adorned with numerous floral motifs. The house was equipped with all the latest mod cons: central heating (through the floor in the winter garden), an indoor elevator, telephone and bathroom or lavatory in each bedroom. Originally designed as a family residence, this luxurious villa was actually only occupied for a few years by Antoine and his wife Jeanne-Josephine. It later became the headquarters and offices of the Lumière company. 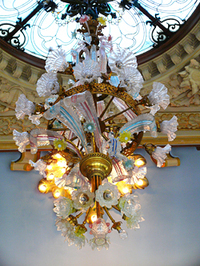 When the city of Lyon bought it, along with the surrounding land, in 1975, the inside was found to be partitioned and the decorations concealed. A substantial restoration programme hence began to restore the rooms to their original volumes and at least to part of their former glory. Today, lighting (that received a prize in 1993 from the French Caisse des monuments historiques et des sites) is used to highlight the restored and now unobstructed facades, thanks to the creation of the 7 000 square-meter green space. The property has been listed on the French Supplementary Historic Monument List since 20 May 1986.